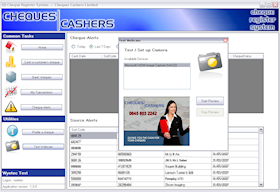 Cheques Cashers Limited is an established and well-respected player in the "personal cheque cashing" market. The "Cheque Register System" manages the business processes of a cheque cashing business. Primarily, it allows agents (franchisees) to cash third party cheques, with the cheque register system managing the transaction details, customer identification, commission rates & charges and, most importantly, warning agents of suspect cheques and account details. The primary requirement was a client-server IT system that provided each franchisee with a desktop client application linked to a central database, and an administration client to provide back-end functions and reports. Left: The "Cheques Register System" client application manages the business process of cashing client cheques – recording transaction details, managing customer identification, and warning agents of potentially risky transactions. Following close consultation with the client, the system was designed as a desktop application, providing a richer interface than can be easily provided by a browser based web application, and interfaces to a webcam, printer and file system. A special feature of the client is an automatic version check on login, ensuring that all clients are always up to date. This feature, achieved with a web hosted MSI download, avoids the common pitfall of version mismatch suffered by many traditional client-server solutions. Webcam technology was integrated to photograph each customer and automatically upload the captured image to the central server. This image is then available to all franchisees as an aid to positive identification if a client visits a different outlet. Elegant and simple reporting facilities allow saving of various reports in Excel and PDF formats using Microsoft Report Viewer components. The system has proved to be solid and reliable for several years now, and is currently being used seven days a week by agents across the country. Contact WyeTec today to discuss your client-server IT application project or proposal.